There is a reason why the drivers of 18-wheeler trucks are seated at the front of the vehicle. It’s so the drivers can steer the vehicle accurately between the lanes. In directional drilling, sensors are usually spaced back from the bit because of the motor and the extra magnetic spacing required to avoid interference. This is the equivalent of steering the truck from the back of the vehicle and the results are predictable. If you consider a sensor that is 45ft back from the bit and an ROP of 15ft/hour, it will take 3 hours for the sensor to be at the same depth that the bit was. By which time another 45ft of well will have been drilled. If the trajectory is on target, no problem, you can probably predict where the new bit position is. If the measurement shows that the trajectory is off target, then not only does that error have to be corrected, there are also three hours of inaccurate drilling to correct. The result is a well trajectory that is all over the place. In thick reservoirs, this may not be so much of a problem but not all reservoirs are like this. In many cases there is one layer that is most productive and any time drilling outside that layer is wasted drilling effort. Even in thick zone shale wells, one layer will represent the sweet spot and drilling outside this layer might mean that a frac stage is not productive, simply because that stage was drilled off target. 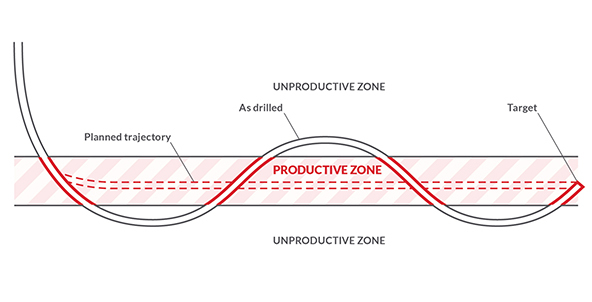 You could lose half of your productive wellbore by exiting below the zone, correcting and then overshooting before repeating the cycle again until you hit the target. A good directional driller in a known formation will reduce this error, and that is what makes them so valuable, but even a good directional driller can get caught out before they have established how a BHA responds in a particular formation. The nearer the sensor is to the bit, the faster the information is relayed back to the driller or the automatic steering algorithm. 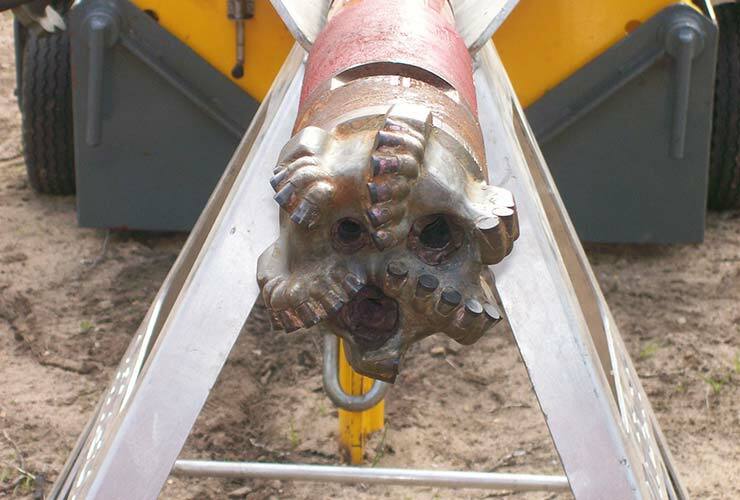 This results in a more accurate wellbore because off-target drilling can be detected earlier. Some BHA’s include near bit sensors with short hop telemetry to solve the problem. There are other gyro steering sensors that can be located just above the motor in a directional BHA because they are not affected by magnetic interference. There are also measurements that will give a reading as the bit passes the interface between one formation and another. Another feature that can help reduce directional drilling errors is the speed at which the downhole data is transmitted to surface. Faster telemetry means that more data can be sent in the same time or it is received earlier. Both of which help the directional driller to respond. In modern coiled tubing drilling systems, the telemetry is over wireline which gives the driller almost instantaneous feedback about tool position, weights, torque and vibration. The benefit of this can be seen from a real-world example shown below. This well had a target zone of 4m in thickness, and the wellbore had to be maintained within this envelope (dotted lines). The original wellbore had been drilled with a conventional directional drilling BHA and is shown in blue. The red line shows the path drilled with a CTD BHA after performing an openhole sidetrack. Allowing for the fact that the two well bores are in a different plane, it can still clearly be seen that the wellbore drilled with CTD maintained its trajectory much more accurately than the original wellbore drilled with a conventional mud pulse BHA and with with sensors further back from the bit.